Continuous hot water at a high temperature for a lower cost, whenever it’s required – that’s the promise Rinnai makes when it comes to its hot water systems. 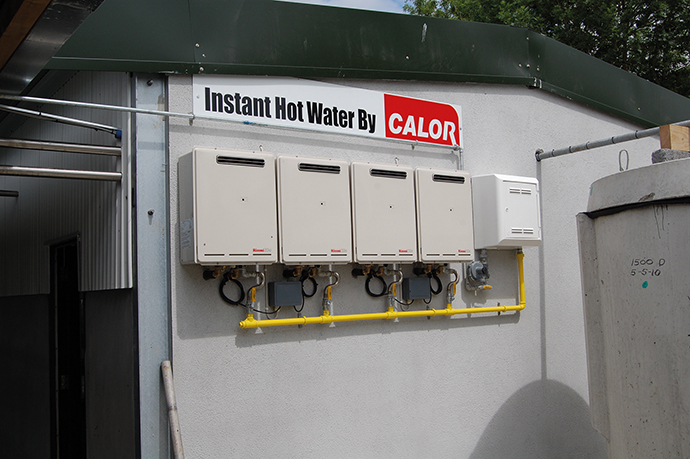 Proving ideal for dairy farms, Rinnai hot water heaters have been installed by Calor Gas at farms up and down the country for the last few years. “They really are ideal for dairy farmers who have to be mindful of heating their water overnight at 9.9 cents per kilowatt hour which they’ll then use in the morning. Once that water is used, they’ll need to heat more hot water and they’ll pay 18 cents per kilowatt hour for that privilege, whereas our solution would run continuously for about 8 cents per kilowatt hour. There’s a significant fuel saving there,” says Damien Shirkie at Calor Gas. Four Calor powered Infinity Rinnai water heaters were installed at Kilmurry Lodge Farm, Ballyneale, Co. Tipperary recently. An established dairy farm with a 210 head herd, the expansion required an upgraded water heating system for the farm’s new milking parlour. Their pre-existing electrically powered installation wasn’t capable of providing enough hot water at a high enough temperature; the new solution provides consistently hot water at 85 degrees C which is required to wash milking lines up to twice daily and the bulk storage tank every second day. There’s also no such thing as hot water storage costs with the new system as water is only heated when required. According to Damien, about 90% of the dairy farms in Ireland currently have electric storage. Electric heating can also pose a problem wherein the dairy farmer might want to heat his hot water up to 70 or 80 degrees but as the water is run off the store, the temperature decreases. With dairy farms now testing for thermoduric bacterium (bacteria which can survive, to varying extents, the pasteurisation process), it’s more important than ever to have hot water available at all times.